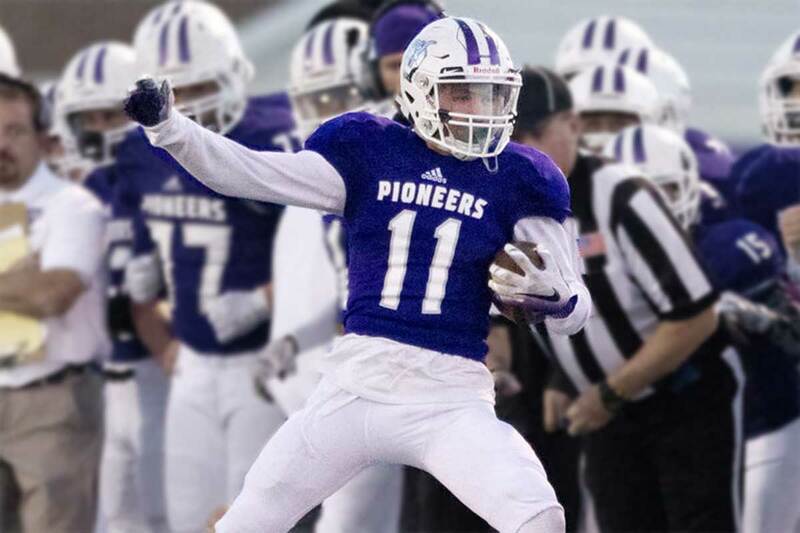 On Monday BYU football received a verbal commit from Kade Moore, a 6-foot-1 175 pound wide receiver from the state champion Lehi Pioneers (Class of 2018). Moore preps at Lehi High School (Lehi, Utah), where as a senior he had five carries for 25 yards and 88 receptions for 1365 yards (15.5 avg) and a whopping 20 touchdowns. He helped lead Lehi to the 5A state championship and was named to the All-State first team. His coach told the Daily Herald that “Kade is probably one of the most underrated players in the state because of his size but what a tremendous talent. He catches everything you throw to him and has great discipline in his routes. He wants to be great every day.” A three year starter for the Pioneers, Moore totaled 3026 receiving yards on 217 receptions (13.9 avg) for his career to go along with 36 touchdowns. He also plays on the basketball team. Moore is rated 2-stars by Scout/247 Sports (downgraded from 3-stars as a junior), and has not been rated by Rivals or ESPN. He has scholarship offers from Southern Utah and Weber State and has also seen recruiting interest from Utah State. He will join the Cougars as a preferred walk-on. Class: 2018 HT/WT: 6’1”, 175 lbs. I caught up with Moore to ask him about his commitment. Moore: For several reasons. I respect what BYU stands for, the name it represents, and the standard established. BYU is special. The amazing coaches care about you becoming a better football player, but also a better person. I was inspired by the other players as well. On my official I could tell they really are a brotherhood and it’s something that stood out to me. The education there is unbelievable and it’s an education that not all kids are able to receive. Coach Kalani is a very big reason, too. He is a man that will love you and put all his time into you so you become better. He really is a player’s coach. I asked many players on the team some reasons why they love BYU. Coach Sitake was always in everyone’s response. BYU Insider: Why do you feel BYU is a good fit for you? What do you most look forward to in suiting up for the cougars? Moore: Ever since I was a kid I’ve loved BYU… wearing a Jordan Pendleton jersey, watching Austin Collie in warm ups, Beck-to-Harline. It’s always been a goal and dream of mine to play at BYU. I’ve worked hard to be able to have a chance to play at the school I love and I’m very excited about this opportunity. The feeling you get around the coaches and players as well as the campus itself is something I’ve always wanted to be around. There is no other place quite like it. BYU Insider: What is your greatest accomplishment in sports? Moore: Probably winning the State Championship my senior year at Lehi. BYU Insider: Anything else you’d like Cougarfans to know about you? Moore: Just that I will work hard, do my best, and strive to make Cougar Nation proud of what we do with BYU Football. The Cougars have a strong tradition and I want to do my part in contributing to that for the future. I am humbled and grateful for this opportunity and I intend to make the best of it.